The fuming World Trade Center debris pile was a chemical factory that exhaled pollutants in particularly dangerous forms that could penetrate deep into the lungs of workers at Ground Zero, says a new study by UC Davis air-quality experts. 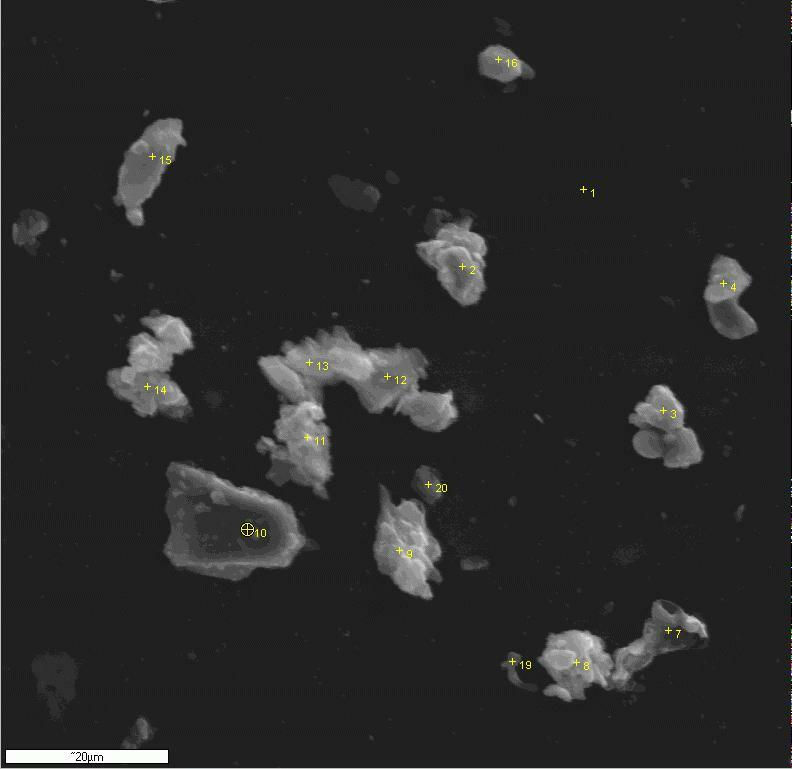 The new work helps explain the very fine particles and extraordinarily high concentrations found by an earlier UC Davis study, the first to identify very fine metallic aerosols in unprecedented amounts from Ground Zero. It will be essential to understanding the growing record of health problems. The conditions would have been "brutal" for people working at Ground Zero without respirators and slightly less so for those working or living in immediately adjacent buildings, said the study's lead author, Thomas Cahill, a UC Davis professor emeritus of physics and atmospheric science and research professor in engineering. "Now that we have a model of how the debris pile worked, it gives us a much better idea of what the people working on and near the pile were actually breathing," Cahill said. 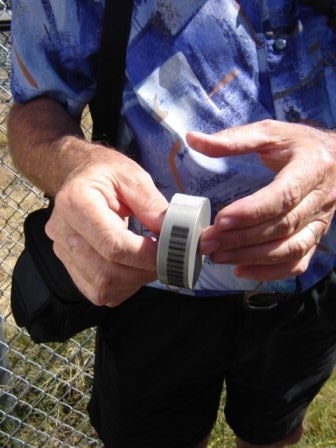 "Our first report was based on particles that we collected one mile away. This report gives a reasonable estimate of what type of pollutants were actually present at Ground Zero. "The debris pile acted like a chemical factory. It cooked together the components of the buildings and their contents, including enormous numbers of computers, and gave off gases of toxic metals, acids and organics for at least six weeks." Cahill, an international authority on the constituents and transport of airborne particles, will summarize the new study today (Sept. 10) at the national meeting of the American Chemical Society, being held this year in New York City. Cahill heads the UC Davis DELTA Group (for Detection and Evaluation of Long-range Transport of Aerosols), a collaborative association of scientists at several universities and national laboratories. The DELTA Group has made detailed studies of small airborne particles, called aerosols, from the trade-center collapse, 1991 Gulf War oil fires, volcanic eruptions and global dust storms, and has most recently finished a massive 21-site study of Asian aerosols for the National Science Foundation. The new study reinforces and extends conclusions that DELTA Group reached in February 2002 in what is still the most extensive analysis of the dust and smoke from the hot collapse piles after the trade center collapse. 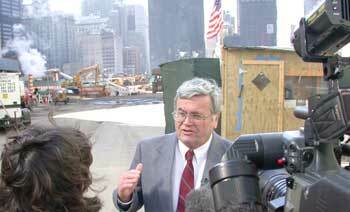 In the 2002 report, DELTA researchers described their analysis of over 8,000 air samples collected Oct. 2-30, 2001, on a rooftop at 201 Varick St., one mile north-northeast of the trade center complex. They detailed very high levels of very fine airborne particles -- particles that pre-Sept. 11 EPA summaries had showed could raise a person's risk of lung damage and heart attacks. 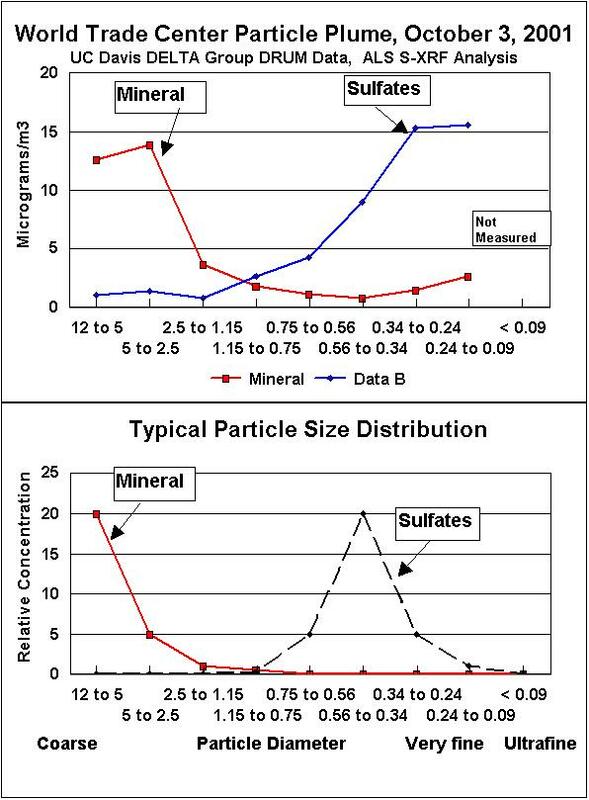 That analysis has been accepted for publication in the peer-reviewed journal Aerosol Science and Technology. 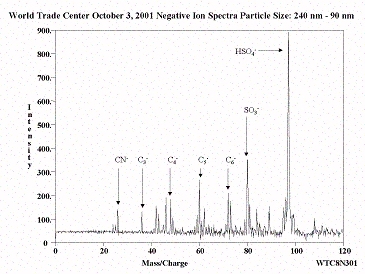 Now the researchers have added analyses of samples collected through May 2002, and constructed a timeline with physical and chemical explanations for the results. The new study also confirms, Cahill said, that the very fine particles observed were almost totally from the trade center debris pile and not from other upwind sources, such as power plants and the diesel trucks used to haul away the debris. When the trade center towers burned and collapsed, tons of concrete, glass, furniture, carpets, insulation, computers and paper were reduced to enormous, oxygen-poor debris piles that slowly burned until Dec. 19, 2001. In that hot pile, some of the debris' constituent elements combined with organic matter and abundant chlorine from papers and plastics, and then escaped to the surface as metal-rich gases. These then either burned or chemically decomposed into very fine particles capable of penetrating deeply into human lungs. 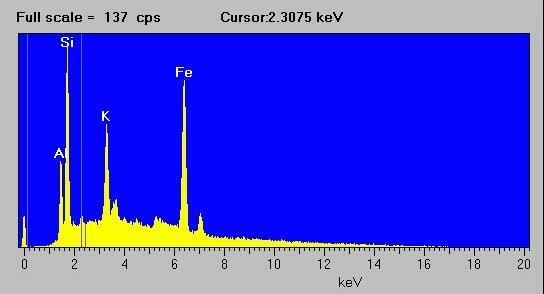 Fine and very fine transition metals, which interfere with lung chemistry. Acids, in this case sulfuric acid, which attack cilia and lung cells directly. Very fine, un-dissolvable (insoluble) particles, in this case glass, which travel through the lungs to the bloodstream and heart. High-temperature organic matter, many components of which are known to be carcinogens. "For each of these four classes of pollutant, we recorded the highest levels we have ever seen in over 7,000 measurements we have made of very fine air pollution throughout the world, including Kuwait and China," Cahill said. 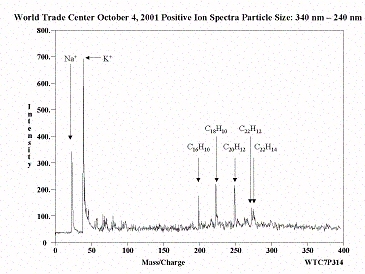 Cahill will report the new findings to the chemical society members today in a special symposium on the trade center. The presentation is titled "Very fine particles from the WTC collapse piles: anaerobic incineration?" It is scheduled for 9:35 a.m. in Javits Convention Center, Room 1A22. A news conference will follow the symposium at noon. The American Chemical Society is the world's largest scientific society. Nine thousand people are expected to attend the Sept. 7-11 conference. Cahill's co-authors on the new study are: assistant research engineer Steve Cliff, professor Jim Shackelford and researchers Mike Dunlap and Mike Meier, all of UC Davis; Kevin Perry, assistant professor of meteorology at the University of Utah, Salt Lake City. A new UC Davis study shows that if they are properly cleaned, apartments and offices near the site of the collapsed World Trade Center towers are safe for living and working. The study also found that the concentration of diesel pollution in lower Manhattan is quite high, which could cause breathing problems in some people. The study was conducted by UC Davis professor Thomas Cahill in conjunction with the American Lung Association of the City of New York. Cahill, an international authority on the constituents and transport of airborne particles, found little evidence that very fine particles persist in indoor spaces near Ground Zero once the areas have been cleaned according to U.S. EPA guidelines. "We knew that large amounts of very fine particles, which can get deep into a person's lungs and cause serious health problems, were released from the super-hot trade center debris piles," Cahill said. "Our new analysis shows that in the sites we tested, those very fine particles either never penetrated the indoor spaces or were effectively removed by professional cleaning." The American Lung Association of the City of New York said the UC Davis results should reassure New Yorkers who have had their homes and offices professionally cleaned by a licensed asbestos and lead abatement contractor. Additionally, the association urged all residents who live in the affected area and who have not yet conducted a proper inspection and cleaning to contact local agencies to schedule one. Cahill heads the UC Davis DELTA Group (for Detection and Evaluation of Long-range Transport of Aerosols), a collaborative association of aerosol scientists at several universities and national laboratories. The DELTA Group has made detailed studies of aerosols from the 1991 Gulf War oil fires, volcanic eruptions and global dust storms. In February, the DELTA Group released what is still the most thorough analysis of the dust and smoke blown through lower Manhattan after the trade center collapse. That analysis found unprecedented clouds of very fine particles. For the new study of indoor air, samples were collected in May at four sites in lower Manhattan -- two apartments and two offices -- to evaluate the persistence of very fine aerosols in indoor areas near the trade center. 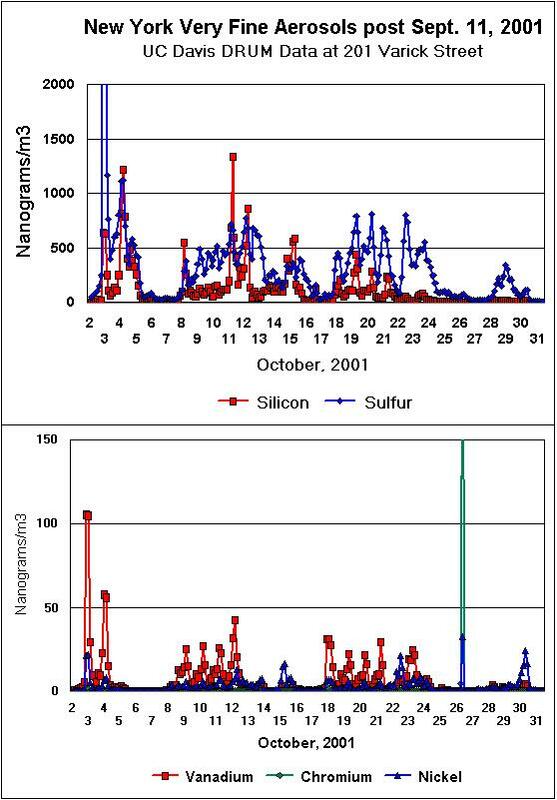 The samples were analyzed for very fine particles of silicon, sulfur (sulfate), vanadium, nickel and lead, all of which the DELTA group had found to be abundant in outdoor air in October 2001. Results were compared against clean control sites and against an average exposure rate about one mile north-northeast of the trade-center site. Cahill found that the amounts of toxins at the four indoor sites studied were low and well within public health guidelines. "This is good news for the residents and workers of lower Manhattan," said Peter Iwanowicz, director of environmental health for the American Lung Association of New York State. "We now know that when proper testing and mitigation are conducted, indoor spaces are as clean as, or in some instances cleaner than, before Sept. 11." However, the study identified another health threat in the area. "The air samples confirmed that diesel pollution from the countless vehicles involved in the recovery and rebuilding effort is heavily concentrated downtown," said Cahill. The recovery, cleanup and rebuilding of the World Trade Center site all employ large fleets of diesel vehicles, from construction trucks to back-up generators. At the three sites closest to Ground Zero where samples for the study were collected, the levels of sulfur, which indicates the presence of diesel pollution, were much higher than at uptown sites. Diesel exhaust particles are known to exacerbate allergies, trigger asthma episodes and decrease lung function in otherwise healthy individuals, according to the lung association. The U.S. EPA says diesel exhaust particles are highly likely to cause lung cancer with prolonged exposure. The emissions from diesel engines also cause fine particle and ozone formation. 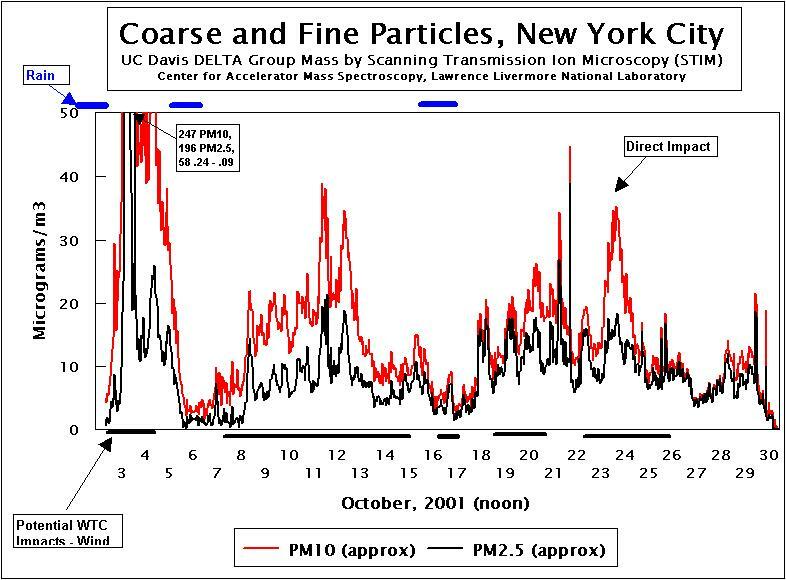 Even before 9-11, New York City's air violated the health standards for both of these pollutants. "The equipment that was rolled in expressly to help this city rebuild and heal is in fact, contributing to long-term health concerns," said Iwanowicz. The American Lung Association of the City of New York recommends that all equipment and vehicles running on diesel fuel be supplied with low-sulfur fuel (30 parts per million or less). According to the Manufacturers of Emission Controls Association, a diesel engine running on low-sulfur fuel and utilizing sophisticated emissions filters can have 90 percent less emissions than one that does not. New York City Transit is currently running all of their buses on low-sulfur fuel and is installing the filters as well, so both are readily available. Legislation to require trade-center-related vehicles to use lower sulfur fuel and these filters has been introduced in the New York City Council (Intro. 191) by Councilman Alan Gerson (Manhattan ­ District 1). The support for this research was made possible by the ALA of the City of New York's 9-11 Respiratory Assistance Fund, which was established to help meet the financial, educational and research needs of a community besieged with lung health concerns. For 100 years, the American Lung Association of the City of New York has continuously provided education, research and advocacy in the fight to prevent lung disease and promote lung health. For more information about the Association, visit http://www.alany.org or call 1-800-LUNG-USA. Cahill was the 2001 recipient of the American Lung Association of California's Clean Air Globe Award, presented to an individual or organization that has made the most significant contribution to the cause of cleaner air in California.